. : About Sensoji Temple :. Senso-ji is an ancient Buddhist temple located in Asakusa, Tokyo, Japan. It is Tokyo's oldest temple, and one of its most significant. Formerly associated with the Tendai sect of Buddhism, it became independent after World War II. Adjacent to the temple is a Shinto shrine, the Asakusa Shrine. 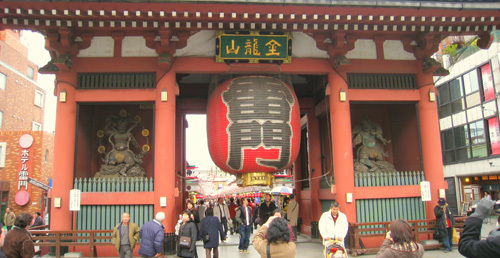 The Kaminarimon (or Thunder Gate) is the outer of two large entrance gates that ultimately leads to the Senso-ji. The gate, with its lantern and statues, is popular with tourists. It's just under 12 metres tall and 11.5 metres wide. The temple is dedicated to the Kannon Bodhisattva (Avalokitesvara). According to legend, a statue of the Kannon was found in the Sumida River in 628 CE by two fishermen, the brothers Hinokuma Hamanari and Hinokuma Takenari. The chief of their village, Hajino Nakamoto, recognized the sanctity of the statue and enshrined it by remodeling his own house into a small temple in Asakusa so that the villagers could worship Kannon. 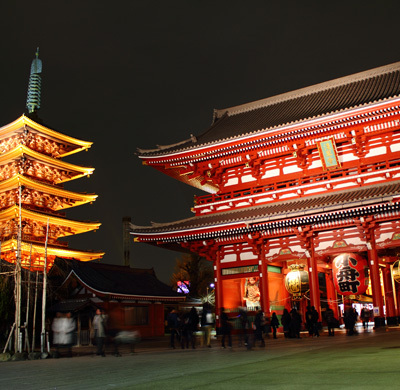 The first temple was founded in 645 CE, which makes it the oldest temple in Tokyo. In the early years of the Tokugawa shogunate, Tokugawa Ieyasu designated Senso-ji as tutelary temple of the Tokugawa clan. The Nishinomiya Inari shrine is located within the precincts of Senso-ji and a torii identifies the entry into the hallowed ground of the shrine. A bronze plaque on the gateway structure lists those who contributed to the construction of the torii, which was erected in 1727 (Kyoho 12, 11th month). During World War II, the temple was bombed and destroyed. It was rebuilt later and is a symbol of rebirth and peace to the Japanese people. In the courtyard, there is a tree that was hit by a bomb in the air raids, and it had regrown in the husk of the old tree and is a similar symbol to the temple itself. Pilgrims and tourists flocking to Senso-ji have shopped at the small stores here for centuries. Dominating the entrance to the temple is the Kaminarimon or "Thunder Gate". This imposing Buddhist structure features a massive paper lantern dramatically painted in vivid red-and-black tones to suggest thunderclouds and lightning. Beyond the Kaminarimon is Nakamise-dori with its shops, followed by the Hozomon or "Treasure House Gate" which provides the entrance to the inner complex. Within the precincts stand a stately five-story pagoda and the main hall, devoted to Kannon. 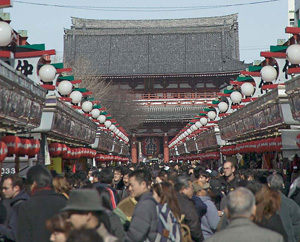 Many tourists, both Japanese and from abroad, visit Senso-ji every year. Catering to the visiting crowds, the surrounding area has many traditional shops and eating places that feature traditional dishes (hand-made noodles, sushi, tempura, etc.). Nakamise-Dori, the street leading from the Thunder Gate to the temple itself, is lined with small shops selling souvenirs ranging from fans, ukiyo-e (woodblock prints), kimono and other robes, Buddhist scrolls, traditional Japanese sweets, to Star Wars toys, t-shirts and smartphone an iPad covers. These shops are part of a long and existing tradition of selling to pilgrims who made the journey to Senso-ji. Within the temple itself, and also at many places on its approach, there are o-mikuji stalls. For a suggested donation of 100 yen, visitors may consult the oracle and divine answers to their questions. Querents shake labelled sticks from enclosed metal containers and read the corresponding answers they retrieve from one of 100 possible drawers. Within the temple grounds is a quiet contemplative garden maintained and manicured in the distinctive Japanese style. Senso-ji is the focus of Tokyo's largest and most popular festival, Sanja Matsuri. This takes place in late spring, and sees the surrounding streets closed to traffic. The next Sanja Matsuri Festival will take place from May 20th until May 22nd, 2016. The Nakamise-dori is a street on the approach to the temple. The street was created in the early 18th century, when neighbors of Senso-ji were granted permission to set up shops on the approach to the temple. However, in May 1885, the government of Tokyo ordered all shop owners to leave. In December of that same year, the area was reconstructed in Western-style brick. During the 1923 Great Kanto earthquake many of the shops were destroyed, then rebuilt in 1925 using concrete, only to be destroyed again during the bombings of World War II. Nakamise-dori shopping street. Pilgrims and tourists flocking to Senso-ji have shopped at the small stores here for centuries.
.: Sensoji Temple entry fee :. Admission to the temple grounds and sites is generally free. However, certain areas have different opening and closing times.
.: Asakusa Hotels near the Temple :. This site is an information resource only and is not affiliated with Senso-ji, or related companies and organisations, in any way. Some of the text on this site is taken from Wikipedia and used under the terms of the Creative Commons Attribution-ShareAlike License. Images are either public domain or used under the Attribution-ShareAlike 3.0 Unported (CC BY-SA 3.0) license and are all attributed in the Alt text of each image.